I’m usually onboard when it comes to any novel or comic book that bears the Dungeons & Dragons stamp. This is for two main reasons: I am a massive D&D geek, and I’ve never had any reason to be disappointed in the past by any D&D novel or comic. I remember picking up my first Advanced Dungeons & Dragons comic (published by DC) back in ’88. It brought to life every D&D adventure I had ever taken part of either at the gaming table or imagined in my mind. A Forgotten Realms series soon came out on its heels. And many other series followed, notably, adaptations of some of the highly popular Drizzt novels by R. A. Salvatore. Darkwalker on Moonshae, the first Forgotten Realms D&D novel came out in 1987, and lots more came right after. The novels were great, and the accompanying comic books were an added bonus, fleshing out in beautiful cinematic pages the enthralling stories and visuals from the covers and texts of novels and adventure modules. 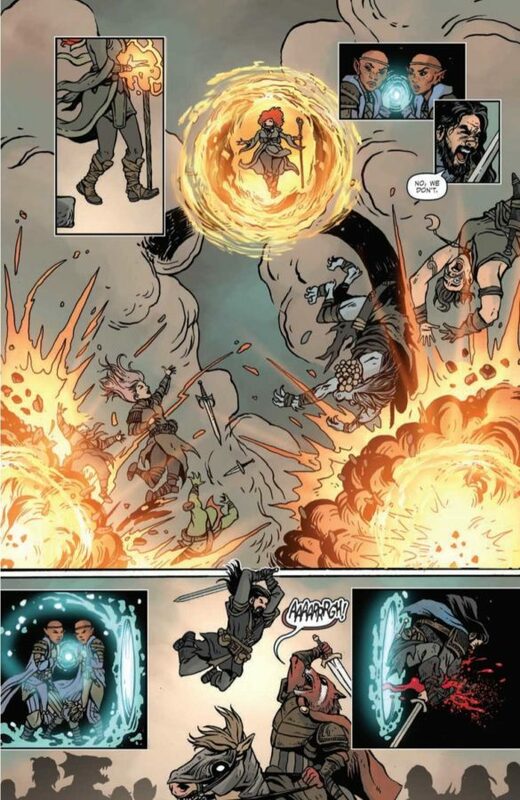 The comics breathed visual life into all the player character classes (fighter, mage, cleric, rogue, etc. ), settings (deep dungeons, dark cities, magical forests, etc. ), races and monsters (dwarves, elves, orcs, liches, dragons and so on) that made D&D gaming such an amazing experience. 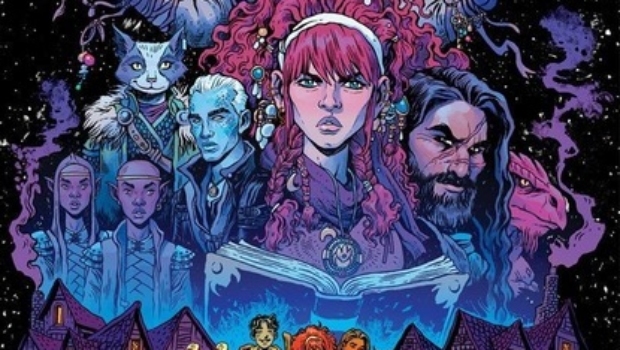 Over the past few years, following the renewed interest in D&D (not that it ever died), we were spoiled with a slew of additional outstanding comic books series such as Neverwinter Tales, Cutter, and the lamented Fell’s Five and Baldur’s Gate series. If you missed Fell’s Five, and if you can still get your hands on the omnibus in stores or on eBay, it’s well worth the investment. It’s a gorgeous book with a treasure trove of additional material that belongs on the bookshelf of any ardent D&D fan. It is also the yardstick by which all other D&D books should be measured, from storytelling and art to character development, inclusiveness and humor. 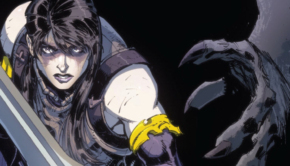 Fell’s Five captured the camaraderie, diversity and adventurousness of a typical D&D party like no other series had since the original series from DC back in the late ’80s. I was a bit surprised when the Baldur’s Gate series was apparently abandoned (almost as much as I was when the gang from Fell’s Five failed to return after their first adventure). 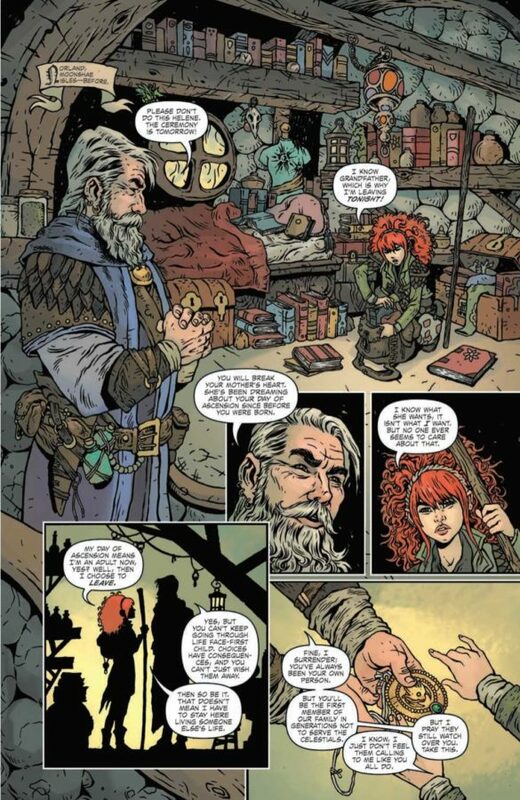 I was still looking forward to A Darkened Wish when it was announced, mostly because it was set in the Moonshae Isles—one of my favorite areas of the Forgotten Realms (one of the worlds where D&D adventures take place). The cover art by Tessa Fowler was promising. It was interesting to see Fowler’s artistic signature applied to the Dungeons & Dragons universe. It reminded me of Wendy Pini’s early work on Elfquest; the cover almost looked like it came off a Neil Gaiman book. The interior art lived up to my expectations, for the most part. 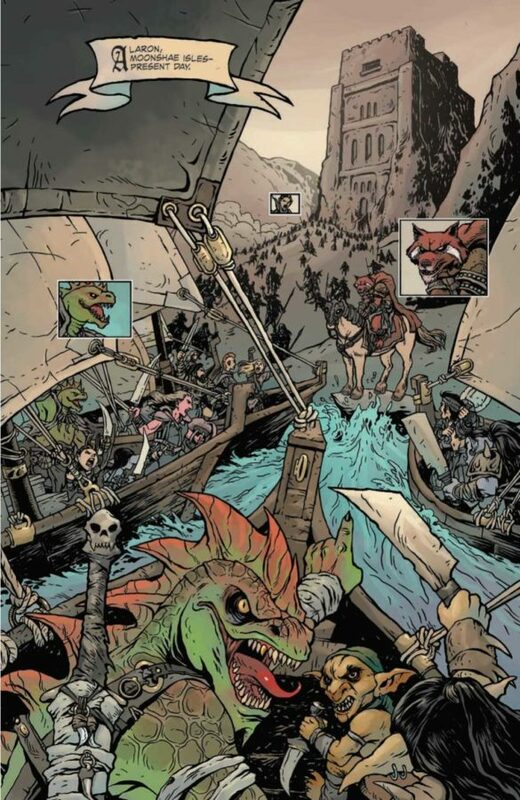 Fowler’s style is a blast of fresh air blowing over D&D comics. 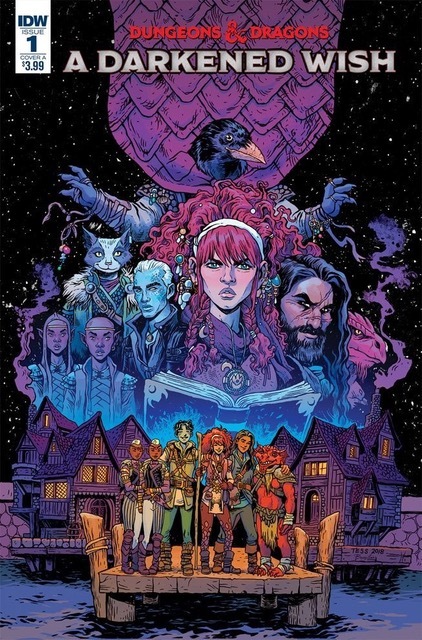 It’s different, colorful, and it’s great to see the Moonshae Isles finally featured in a D&D comic book. Missing, however, is the magical aura that such legendary artists as Tim Hildebrandt and Keith Parkinson breathed into the covers and interior art of adventure modules, gaming supplements and novels set in the Moonshae Isles back in the days. Obviously, comic books are a different medium, but I still felt that A Darkened Wish failed to fully capture the essence of the picturesque Moonshae Isles. The art is still impressive, but the action sequences are rough and frame placement is jarring at times. Characters take center stage over setting and story in this book. 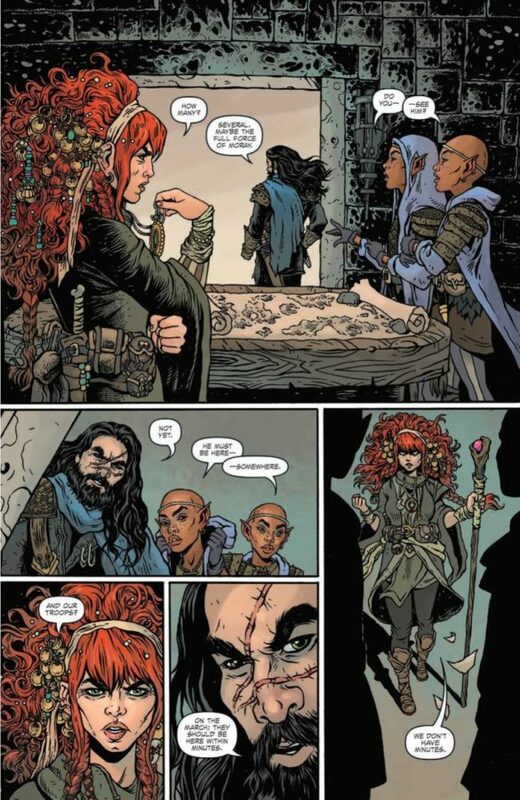 In the purest and most beautiful D&D tradition, diversity appears to be a key component of A Darkened Wish, based on the many different characters introduced in this first issue. 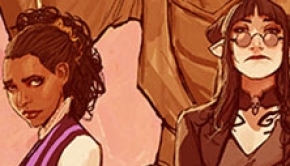 There are the two elves whose gender is left purposely vague, the strong female character, a Dragonborn (a humanoid race with mixed dragon and human ancestries) and even a Kenku (a humanoid, flightless avian race) who is by far the most interesting character of the lot. It makes for an interesting mix of characters, abilities, backgrounds and personalities, just like your typical D&D party of adventurers. D&D has always been inclusive, long before inclusivity became trendy or something that politicians use in their platform. This was evident as far back as the original D&D comic book from the ’80s, where the party of adventurers was an almost even split between males and females. The cast of characters included a doughty male dwarf, an emo male centaur, a tiny half-elf maid who was all but defenseless, and a black female warrior that kicked butts long before Hollywood coined the expression “strong female character.” This was inclusiveness by definition, not per a list, not per a trend. 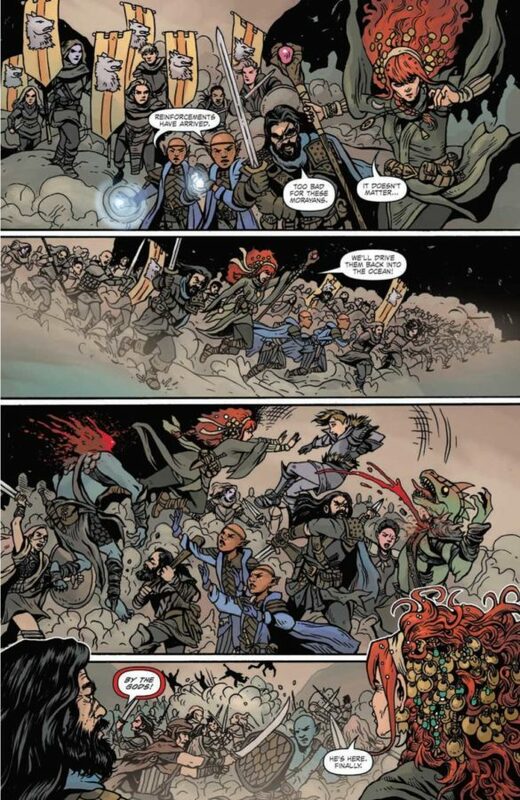 The same can be said about the Fell’s Five and Baldur’s Gate comic books where the beautifully ragtag parties of adventurers felt just right; like they had been developed to bring in differences that, when blended in, would yield amazing situations, mayhem and adventures. The camaraderie in A Darkened Wish is still endearing, but I would have loved to have seen more of the ribbing, light conflicts and character clashes that breathed more life and realism into the groups from the previous series. I’m missing the subtle personality and even somewhat racial conflicts between, for example, the dwarf Khal Khalundurrin and the elf Varis in Fell’s Five. In A Darkened Wish, the characters are on a hugging basis from the get-go, sharing a meal on the deck of the ship where they all meet, clasping each other’s shoulders like a bunch of old chums. 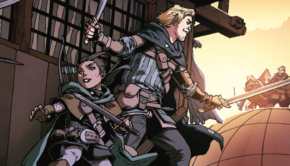 I understand that in a typical D&D game, for the sake of expediency, most adventurers’ friendship kickstarts when the Dungeon Master says, “you all meet in a tavern,” but usually, in the comics, more effort is spent on setting the scene, the characters and their origins, and what brings them all together. However, it is still too early to judge for A Darkened Wish; this is, after all, only issue #1, and I am looking forward to the next issue. In crafting A Darkened Wish, it is obvious that great efforts were spent to research the Forgottten Realms, most particularly the Moonshae Isles. The Forgotten Realms are as rich as Middle-Earth, and A Darkened Wish has numerous nods to the Realms’ setting, its geography, its famous locations, races, and legendary creatures. Fans of Forgotten Realms novels and D&D gamers who favor the Forgotten Realms will feel right at home. This book was apparently written for a younger audience, and that is fine. In many ways, it reminds me of the D&D animated series (which was awesome because it appealed to different age groups, and it was a welcome relief from the often mind-numbingly blah Saturday-morning cartoon crowd of that era), but despite that and Fowler’s art, A Darkened Wish falls somewhat behind the best of the previous D&D comic books. 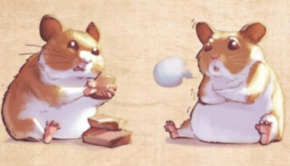 Baldur’s Gate writer Jim Zub’s absence is deeply felt. I would have preferred to see more of Fell’s Five, or of the gang from Baldur’s Gate. A Darkened Wish is a limited series and this is only issue #1. I feel the next few issues will still surprise readers. This first issue ends on a very satisfying cliffhanger that makes me look forward to issue #2 despite my limited misgivings about the first issue.